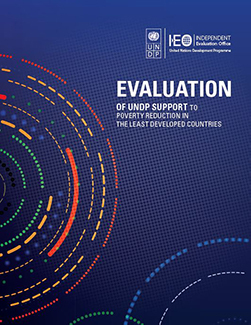 This evaluation examined assessment of UNDP support to poverty reduction in the least developed countries (LDCs), covering the period 2014 to 2017. The evaluation assessed UNDP’s contribution to reducing poverty across five streams of UNDP support: inclusive growth and employment, local economic development, sustainable livelihoods, early economic revitalization, and Millennium Development Goal (MDG)/Sustainable Development Goal (SDG) integration. The evaluation recognizes the major role that UNDP plays in support of poverty reduction in LDCs and lays out a number of recommendations for further strengthening this support, consistent with the UNDP Strategic Plan 2018-2021.